Today, adipic acid is produced by opening cyclohexane using large volumes of nitric acid, a process that emits the ozone-depleting greenhouse gas nitrous oxide. But Kuo Chu Hwang and Arunachalam Sagadevan from the National Tsing Hua University in Taiwan have discovered that ozone and UV light provide an effective alternative. 'Our process is far greener, milder and more environmentally friendly,' Hwang tells Chemistry World. The physical chemists bubbled ozone through neat cyclohexane while shining UV light on it at room temperature and pressure. After a few hours, adipic acid precipitated. 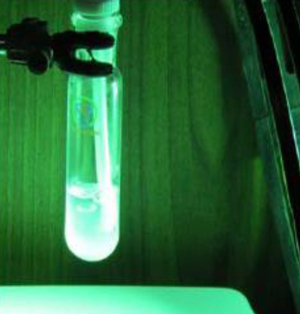 They optimised the cyclohexane to adipic acid conversion yield to 75% by getting a brighter lamp, letting the reaction run longer and adding weak acid. The method also worked well on a variety of other ring structures. Yale University's Nilay Hazari calls the C–H bond oxidation method 'elegant', and asserts that it could result in improved industrial adipic acid synthesis methods. While Hwang is yet to work out a cost comparison for the new route, he notes ozone can be made cheaply from oxygen in the air. His next step will be increasing the scale from 6.5ml currently, including bringing in chemical engineers to design and optimise larger scale reactors. Though Hwang says 'many things have to be overcome and optimised' he is 'optimistic' about the prospects. Article excerpted from Chemistry World.